Honda string trimmers are built using innovation and cutting-edge technology that you just won’t find anywhere else. Their tools are carefully designed with ergonomic components which make their tools comfortable and provide efficient operation for prolonged use. Honda string trimmers are also built to be reliable durable; every Honda tools deliver legendary quality and high performance. The VersAttach TM technology uses up to six interchangeable attachments to tackle various yard tasks. Honda String trimmers have a reputation for providing 100% quality in their product, from the thick weeds to grass line; a handheld Honda trimmer offers exceptional efficiency, comfort, and performance. Make quick work of heavy brush, thick grass, a smaller sapling that has strong low-end torque. They specialize in one type of string trimmer which is the gas trimmers, and it was built to perfection, it comes with the latest and best technologies in the industry. Honda manufacture only gas trimmers and they are highly equipped with the most sophisticated features that make trimming task be like a walk in the park. The trimmers’ features GX35 mini 4-stroke and GX25 engines, the GX25 and 35 are one of the quietest and lightest 4-stroke engines on the market today. You will never have to worry about mixing oil and gas because it requires no fuel mixing. Honda trimmers also feature also an easy to start technology, with their superior design, the trimmers are very easy to start, just a quick and easy start. Honda trimmers are smoke-free with no smell that can ruin your day and they have fewer emissions when compared to the 2-stroke trimmer. They also have strong low-end torque feature which allows many tasks to be performed at partial throttle. Honda engines are known for durability with high-quality components and superior design; this makes them more reliable and troubles free drivers. The trimmers have anti-vibration technology which makes it more comfortable to use. Honda’s 4-stroke engines are 360 degrees inclinable. The tools can be used and stored in any position. They also feature loop handle designed to be comfortable. Honda is one of the few who improved their gas-powered trimmers, when you buy Honda trimmers you can be assured that you are getting a product that is reputable as one of the leading gas-powered string trimmers. These Honda string trimmers’ reviews will give you everything you need to know about them. 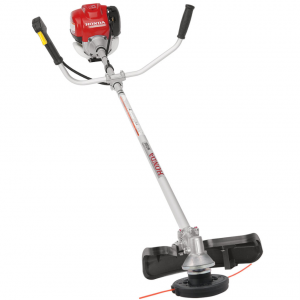 Honda HHT25SLTAT Honda Trimmer is the four-cycle engine which means that you don’t have to mix oil and gas for fuel. With 25 ccs of displacement power, it has enough power for almost any residential trimming need, and it works quickly and easily. The 25 cc engines have enough power to get at tall weeds and grass, and the 19.6-ounce fuel tank means you don’t have to run back to the garage every 25 minutes for more fuel. This Honda grass trimmer is easy to use and powerful enough to remove any tall grass, brush, and weeds that are on your property. When your line becomes worn to use, just tap the head on the ground for more nylon string. It is a straight-shaft trimmer which let you maneuver the weed eater under any steps, fences, porches, or playground equipment on your property. It is lighter, quieter, and easier to use than most other gas trimmers. It’s also controlled by a trigger mechanism that allows you to change the speed of the engine. With the four stroke engine, Honda 4-Stroke Multi-Tool VersAttach Power Head Honda’s GX25 is quick and easy to start with no hassle. The trimmer has a complete 360-degree operation that makes it possible to store and use, the VersAttach can be upright, sideways or upside down. The power head comes with a pair of goggles and harness, this gives you control and makes it convenient when using the tool. The trimmer offers the lowest sound possible at both full throttle and idle level better than any of its competitor, the maneuverability and balance are superb due to its optimization of its engine center of gravity. The powerhead is equipped with anti-vibration, the rubber shaft between the clutch and shaft reduces vibration and this makes it more comfortable for you. The tool is also fuel efficient saving up to 50% of the cost of operation when compared to 2-stroke engines. The trimmer has a sure loc system which makes it easy to connect the attachments, to lock the attachment just push and click. The VersAttach has options for six different attachments which are hedge trimmer, trimmer, edger, cultivator, pruner, and blower. The trimmer is designed to handle both commercial and residential trimming task. The Honda UMC 435 Versatile Attachment-Ready VersAttach Powerhead is a piece of tool that offers so many possibilities. The VersAttach line has two different power heads and six different attachments so that you can quickly change which piece of equipment you are using. These attachments include an edger, a trimmer, a cultivator, hedge trimmer, a pruner, and a blower. But these attachments are sold individually. The UMC435 has ultra-lightweight GX35 Mini 4-Stroke engine. This engine combines efficiency with power. Plus, since it is a 4-stroke engine, there is no need to mix oil and gas. You don’t have to worry about stressing yourself when trying to start the tool because it is quick and easy to start. The innovative design of the engine makes complete 360-degree operations are possible; the engine can be stored in any position without fear of damage or leakage. This engine has the lowest sound level both full throttle and idle and of any competitor. The sure loc system makes changing attachments easy. Just twist, lock and you are ready to go. Honda included a harness and a pair of goggles for added convenience and control. It also has a built-in anti-vibration mounted shaft for less operator fatigue. The Honda Quick Start system provides a quick, smooth start. It has a 4 Stroke Engine which is one of the most reliable in the industry. It is also ideal for professional whose needs a regular trimmer for clearing thick brush, small trees, and saplings, also Included is a 10 inches blade. The optimization of the engine’s center of gravity makes the trimmer to be balanced and easily maneuverable, as well as the location of the handle and throttle assembly. You don’t need to waste your time mixing oil because those times are over when you use this trimmer, and the engine runs on straight and unleaded gas. You will also save money on fuel when using the trimmer because the fuel efficiency costs less to operate when compared to two-stroke trimmers and it has more power. The tool has a 360-degree inclinable engine which can be used and stored in any position. 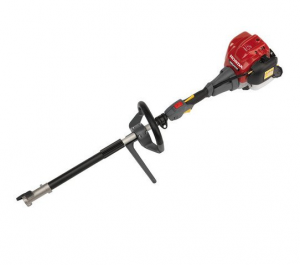 Honda HHT35SUKAT 35.8cc Straight Shaft 4-Cycle String Trimmer quiet Line significantly reduces the trimmer’s noise level for a stealthy and more comfortable trim. The GX35 creates less vibration than comparable engines. The U shaped handle design makes the tool more comfortable to operate, and it gives it a precise control, which allows you to reach the areas that difficult to access. 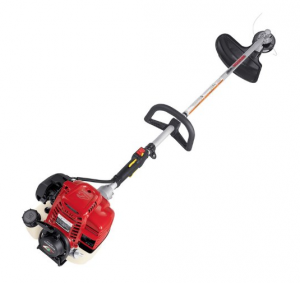 Honda HHT35SLTAT Honda Trimmers is powered by the GX35 engine; it is designed to give you an excellent experience. The engine has an anti-vibration technology fused to the clutch of the trimmer that aims to lower the level of vibration which consequently reduces hand fatigue and give your excellent users experience. The trimmers’ 4-stroke engine means you don’t have to mix gas and oil; this means you won’t get stained with oil. Another nice feature is the collection of add-ons and blades to increase the utility of the trimmer. The trimmer comes with a shoulder harness and a pair of useful protection glasses, and it also boasts of loop handle which is designed for better grip to make it comfortable. The torque is also great; it allows you to use throttle for most of the task. Honda HHT35SLTAT Honda Trimmers demonstrate incredible power from starts up with ergonomically designed trimmer; it is made on commercial standard with residential home users in mind. The downside to the trimmer is that it is expensive and bulky to use. Everyone wants a perfectly mowed yard, but there is so much lawn mower can do, string trimmers are the easy way to reach areas where the lawn mower cannot access. They allow you to trim the grass around your walkway and hedges which make your yard beautiful. Shopping for the right string trimmer could be confusing unless you have clear priorities. Here is the buying guide to help you select the best string trimmer for your yard. String trimmers come in many sizes, shapes, and weights and there all have an effect on the performance of a trimmer. But the major factors to consider are the type of the trimmers and the kind of shaft that comes with it. Curved shaft trimmers: They have slight curve close to the trimmer head, the curved shaft is ideal for small. They are usually lighter and perfect for trimming around flower beds and smaller lawns. They are easy to use and maneuver; they are slightly shorter than straight shaft making it simpler to transport. The curved shaft also makes trimming unwanted weeds around the posts and fences easy. Straight shaft trimmers: They are designed for an extensive reach and more demanding grass jobs which make it simpler to reach underneath the tight spot and trim the bushes, shrubs, and hedges. These are all possible due to its straight shaft; they are more durable and sturdy for tall grass, brush, and large yards. It is usually more comfortable for users that are taller. Detachable shaft trimmers: The most compelling feature of the trimmer is the removable head that provides the option of using varieties of supplemental attachments. You can convert it into a multi-purpose trimmer offering versatility. Gas-powered trimmers: They are a powerful device that is designed to cover large yards and cut through thick brush. They are typically a two- or four-cycle engine. They offer power; they can trim weeds, tall grass, and clear brush. They are the heavy-duty string trimmer for professional landscapers. They are not limited by an extension cord, and they can work for a longer time. Electric powered trimmers: There are two different types of electric trimmers; electric string trimmers also known as corded trimmer are a rechargeable trimmer that makes you of extended cord and battery powered commonly referred to as cordless string trimmer, unlike corded trimmer they make use of a battery which makes your movement unlimited. They are both easy to start, quiet, and lighter than gas-powered string trimmer but not as powerful. 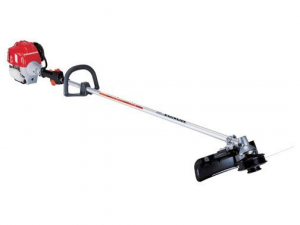 All Honda string trimmers have great features and functions; you will get the value for your money on any of the trimmer you later decides to buy. They feature powerful 4-stroke engines that give you maximum power if you are looking for a trimmer that is sturdy, durable and gets the job done then choose any one of Honda trimmer above.